How do you find someone when the only clue you have is incorrect? Of course, you don't know the clue is incorrect until you have exhausted multiple avenues of research and come up with nothing. You keep looking, because that is all you have to go on, but you start to review clues which are close, because you start to suspect there is an error. This situation happened to me while I was researching my great grand aunt, Mary Kurtz. She was one of August and Minnie Kurtz's 11 living children in 1900. August and Minnie had two children who were born in Germany and made the trip with them to the US and 9 more born in Fayette County, PA.
Minnie's obit listed Mary as Mrs Mary Biber. Only problem. No mention of any Biber family or wedding in Fayette County that I could find. Another clue from Minnie's obituary was that Mary and her husband lived in Pittsburgh. I had assumed that Mary Kurtz had met Mr. Biber near home and they had married in her home town, which is usually the traditional scenario. Months of on again off again searching with no results. In my searches of ancestry.com and familysearch.org, I found dozens of Mary Kurtz's in Pennsylvania. None of them appeared to be the one I was looking for. I had searched for Mary Kurtz and for Mary Biber. Finally, found a family in Pittsburgh named Biber, but they seemed to be from France. It didn't look like a fit. I am not sure when, but recently familysearch.org has added some new marriage documents from Pennsylvania counties. I found a marriage record from Mary Kurtz and Adam Beaver. Not really close, but it was worth 30 seconds of my time to check out. In addition, I had been wondered if "Biber" would have been pronounced with a long "i" sound like tiger or with an long "e" sound like a bee. The official county record was interesting. It showed that Mary Kurtz was from Connelsville, PA (where my Mary Kurtz would have lived) and Adam Beaver of Pittsburgh, PA. I decided to try entering "Adam Beaver" as Mary Kurtz's husband in my Ancestry.com record and do a search and see if anything came up. As it turns out "Beaver" must get confused for "Bieber" from the German, because Ancestry.com caught it as a potential mispronunciation. It brought up a Pittsburgh church record which showed the same wedding, but gave Adam's name as "Beiber" instead of "Beaver". I could easily see how "Biber" and "Bieber" could have gotten mixed up on the obituary. The evidence seemed to be adding up, but I wasn't 100% convinced. I was able to find a naturalization record for Adam Bieber. Adam's naturalization record detailed the name of his wife and where she was born. I had uncovered in my research of Mary's brother, Julius Henry Kurtz, where he was born. I outline my research in the post "Julius Henry Kurtz, The Key to My German Ancestry". So if Mary was born in the same place....I could feel pretty confident that I had, indeed, found August and Minnie's "missing" daughter, Mary Kurtz. Julius Henry was born in Essen, Germany and, you guessed it, so was Mary Kurtz Bieber. Now you may be asking, now that I have found that Mary married Adam Bieber....am I distantly related to the newly famous young teenage heartthrob, Justin Bieber. It is easy to only feel sympathy for my wife's relative, Amelia Lanz Hall and her family, but there was another victim of Leo Hall's deception -- Kittie Loughrey. Kittie Loughrey born May 5, 1892 was from Fulton, NY and was the daughter of James and Mary McCabe Loughrey. She worked as a clerk at Oneida Community Plant in Sherrill (I have no information about this employer) when she met Leo Hall. He must have been quite a charmer, since he convinced this 29 year old to marry him without knowing much about him. They married on January 12, 1921. The left for Florida in February for a honeymoon. After Leo's legitimate wife started asking questions about his whereabouts, it appears that Leo Hall either abandoned his new wife, too or she realized that he was already married and left him. Either way, Kittie Loughrey was embarrassed, ashamed and scandalized. In the 1920's her future prospects of a happy life must have looked pretty bleak. While still in Tampa, FL, she sent her parents the following letter which appeared in The Post-Standard, Syracuse, NY on May 27, 1921. Don't think that I have forgotten you, for I have not, but mamma, under the circumstances it is best to try and forget me. I am down here working for $12 per week. I found out the truth about Leo and I don't feel like I as if I can come home and be as I used to be. That is why. I dream of home all the while and am lonesome. My God, nobody knows. I don't know what I have done to this earth to be used as I have been. I always tried to do what was right by everybody, but here I am among strangers and hundreds of miles from home. People who do not care for me and mamma, the thought makes death feel easier in this lonesome place. Mamma, I was innocent about Leo and I thought he was single and that I was really and truly married to him. What in God's name did I do to get in this trouble? How are you and dad? Maybe in a few years I will be able to come home and meet my friends when the truth is known. I am not with him now and I am working every day. It is very hot here. Mamma, I am going by my own name Miss Kittie Loughrey and praying that this will clear itself. From the letter to her parents, they found out her return address and sent her money beseeching her to return home to Fulton, NY. Within a few months, she did return. She even found a husband. She married Frederick Leggett sometime before 1930. Frederick appears to have been married before and had two existing children. While at the worst of her situation she may have considered if she could endure another day, she lived a very long life. She died at the age of 96 on March 28, 1989. I wonder if she ever told her legitimate husband what she had gone through or if that was a secret she took with her to the grave. As outlined in my last two posts: "Leo W Hall, Bigamist and Scoundrel" and "The Manhunt and 'Death' of Leo Hall", this distant relative (through marriage) of my wife, was a source of family scandal. In July 1921 he was sentenced to 1 year and two months in Auburn prison in New York State. 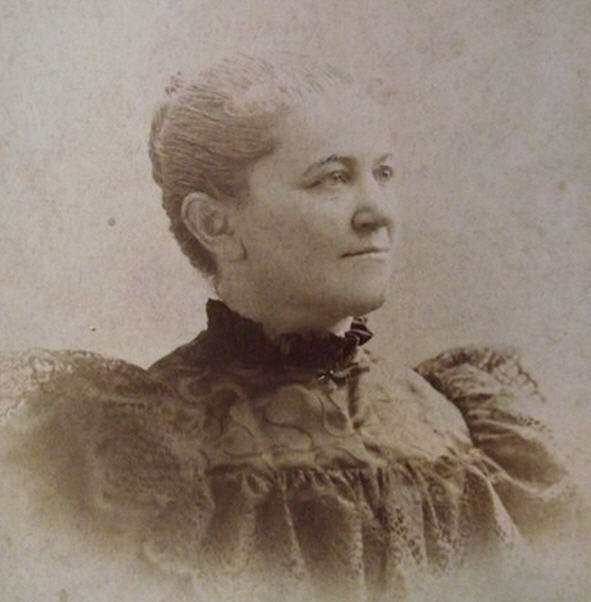 While Leo Hall was on the run with his illegitimate wife in Florida and while he was prison, must have been an incredibly hard time for his legitimate wife, Amelia Lanz Hall. As I have already stated in my previous posts, Leo Hall had cleaned out the family bank accounts before he left which would have left his wife and child with no money and no source of income. Try to imagine what it must have been like to be Amelia Lanz Hall. Embarrassed with all her family's dirty laundry aired in the local papers, destitute and relying on assistance from her brothers and sisters and concerned about the health of her young children. She must have felt like everything was against her. Her oldest son, Joseph, was taken ill which lead to him losing his sight. He was born in 1914 and would have only been 7 or 8 years old at the time. She actually had to send him to an institution to provide care for him. Since medical treatment wasn't very advanced, it is likely he may have died in that institution. I can find no record of him ever returning to live with his mother or any information about him from the 1930 US Census. Sadly, his father's betrayal may have contributed to him leaving home, never to return. Amelia's youngest child was born January 27, 1921. Just a few days before Leo abandoned the family. I can find no record of the child in newspapers or census information. I hope that she went to live with a family member, but it is likely that in Amelia's time of sorrow and possible depression, her small child died before becoming a toddler. I only find records of her daughter, Beatrice Hall. Beatrice was born on May 19, 1918 in Utica, NY. She was almost 3 years old, when Leo left. 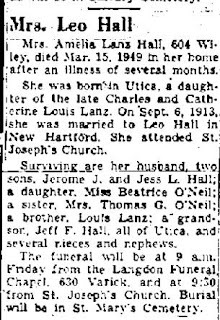 Due to the horrible family financial situation, Beatrice Hall went to live with Amelia's sister and husband, Caroline Lanz O'Neil and Thomas G. O'Neil. Caroline was 45 years old and childless and must have been excited to care for Beatrice. Besides occasional visits, it appears that Beatrice never lived with her mother again. Somewhere in the 1930's, an adoption took place and Beatrice became officially a daughter of the O'Neil's. Again, try to imagine the loathing that Amelia must have felt for Leo and the situation that he had forced upon her. The humiliation and loss of family. Amazingly, when Leo Hall was released from prison, he and his wife reunited. I am at a loss to explain how this could be possible. Either she was a religious woman of infinite forgiveness or just felt that circumstances had left her no other choice. It is unclear if she was waiting to pick him up on the day he was released from prison, but they must have gotten back together fairly quickly. By 1930, the US census shows they were living together in Fayetteville, NY (about 50 miles from Utica). It appears they had likely moved away from Utica so that Leo would be able to find someone who didn't know his story and where he could find work. Ready for the real shocker?! They had TWO more children together! Jerome Joseph Hall born April 9, 1924 and Jess Leo Hall born December 17, 1926. 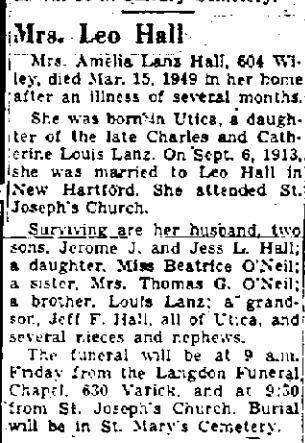 After a very hard and trouble filled life, Amelia Lanz Hall died at the age of 62 in Utica, NY on March 15, 1949. Leo lived until July 11, 1958. 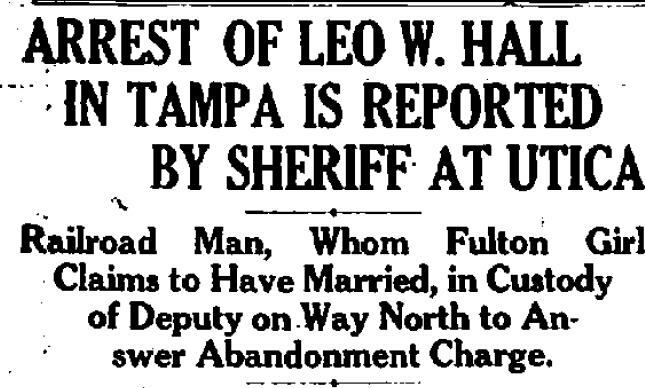 As detailed in my previous post, "Leo W Hall, Bigamist and Scoundrel", Leo Hall abandoned his wife and children to marry another woman and ran off to Florida for his honeymoon. His first and legitimate wife, Amelia Lanz Hall, was unaware that he had left her for another woman. Leo had told her that he had been assigned to some work in Minoa, NY (about 50 miles from Utica, NY). A few days later she received a letter from him informing her that he had been given a pass from the railroad company for free travel to Richmond, VA and was going to take Amelia with him. Several days went on with no word from him and she became concerned. She contacted the railroad and was informed that he had indeed traveled to Richmond, VA, but had been accompanied by another woman, Kittie Loughrey. Frantically, she asked for an investigation and learned that Leo had married a woman in Fulton, NY. A warrant was issued for his arrest on the charge of abandonment in the southern states of Virginia, North Carolina and Florida. About this time, Kittie's parents, James and Mary Loughrey received a telegram from their daughter in Florida informing them that stated "Leo is dead. Will arrive home Wednesday or Thursday". Amelia's relatives scoffed at the idea that Leo had somehow conveniently died. One of Amelia's brothers stated in the paper, "He never did anything as good as that -- dying." It is important to note that Leo had emptying the family bank accounts before he left which left the family destitute. He had three children. One a newborn (born only a few days before he disappeared), a daughter, Beatrice and a son, Joseph. Joseph was discovered to have an eye problem and was nearly blind. His mother was in such dire straights financially that she had to put Joseph in an institution for treatment as she didn't have the money to care for him at home. A week before the telegram was received, the Loughrey family had received a letter from Kittie stating that Leo was sick in a hospital in Jacksonville and to send money. When authorities contacted the hospitals and morgues in and around Jacksonville there was no evidence of anyone dying named Leo Hall. Legal authorities disregarded the supposed death of Leo Hall and continued to search for him to bring him to face charges for abandonment. 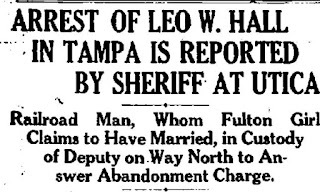 Authorities eventually caught up with Leo Hall and arrested him in Tampa in June 1921. He was brought back to Utica to be prosecuted. From the newspaper accounts, the legal case against Leo Hall was an open and shut case and he was sentenced to 1 year and two months in Auburn prison in New York State. He began to serve his sentence on July 1, 1921. Leo W. Hall married my wife's distant cousin, Amelia Lanz in 1911. They appeared to be happily married and had at least three children between 1911 and 1921. They lived in Utica, NY. Leo Hall was a "fireman" for the railroad. As a fireman, he was in charge of tending and stoking the fire for a steam locomotive. This role must have had him working some short or intermediate trips working on trains and did take him away from his family from time to time. On at least one trip from his family he met and seduced a woman named Kittie Loughrey in Oneida, NY. He purposefully mislead her to believe that he was single and convinced her to elope with him for a wedding in New York City. So on January 12, 1921, they were wed. Of course, the only problem being that he was already married. Unlike some stories about bigamists that you may hear about where the bigamist lives a secret life with multiple wives or families, Leo Hall used his new marriage as an opportunity to abandon his legitimate wife and kids. Just prior to his disappearance, he returned to Utica for the birth of his third child on January 27 and remained in the city until his wife returned from the hospital on February 12th. Upon her return home, he left, probably never intending to return. Leo was busy while his wife was in the hospital. He cleaned out the family bank account and took with him all the family valuables. If it wasn't enough to leave his family with nothing, he then proceeded to charge to a store account in his wife's name for two suits and a gold watch. He gave the gold watch to his new bride as a wedding present. Leo and his new wife departed by train for a honeymoon in Florida. In my family research, it has become apparent that oral family histories only seem to record events as far back as possibly great-grandparents. In some families even less depending how much the family talked with their children about the "olden days". Which is why I have encourage my mother and my in-laws to write down any of the family stories that they remember so that can be passed on....so far no luck with that. My mother-in-law, has a number of stories about her great-grandmother, Margaret Lanz. Margaret Lanz was born in Bavaria, Germany in December 18, 1847 and came to the US when she was 20 years old in 1867. My mother-in-law never met her great-grandmother, as she died at the age of 84 in 1932. However, her mother and grandmother passed down family stories about her. Margaret had married Andrew Reath sometime shortly after her arrival. Andrew Reath died in 1895 and she never remarried. The story of Margaret's journey to America has been passed down. She left Europe on a large sailing ship to the US. During the trip, it was "calmed" from lack of wind for several days, which unnerved and scared Margaret and from that point on she was always afraid of large bodies of water. So much so that she never learned to swim and didn't even teach her children to swim. I have not found her immigration records, but it would be interesting to see if I could find if the sailing took much longer than usual. Margaret was an excellent seamstress. It must have been in her genes, because there are stories passed down that her daughter, Margaret Reath, would go to the department stores in Utica, NY and look in the windows at the latest fashions and then she would make similar dresses at home from memory for her daughter. Saving considerable expense. These stories and a few others have survived the generations. However, one interesting fact which was never was passed down was whatever happened to Margaret's parents. Had they made the journey with her or had they stayed in Germany. I had always assumed (as had my mother-in-law) that they had remained in Germany. 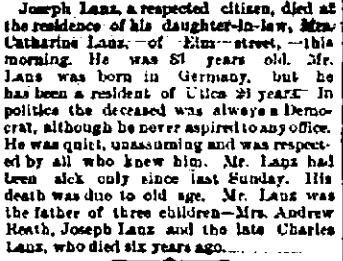 I recently ordered a death certificate for Margaret Lanz Reath from the City of Utica, NY to see if it might offer any the name of the city she were she was born in Bavarian. It didn't. However, it named her father and mother as John Lanz and Caroline Breitenberg Lanz. Interesting information. So, if I do find where she was born in Bavaria, it might help me find Germany records. While trying (in vain, so far) to look at leads for her German origins, I was reviewing the 1880 US Census records and I noticed a John and Caroline Lanz living next door to Margaret's brother John Joseph Lanz and his family. Coincidence? Nope. I have actually found this quite often in my research where related family members tend to live close to each other, so I do try to look at the census records to see if any potentially "lost" relatives turn up. To be sure that they were THE John and Caroline Lanz, I searched to find a death record for John. I was successful at finding John's obituary (The obit says "Joseph", but that is an error. It was probably his middle name. He is listed in the Utica deaths for the year as John and on that date). 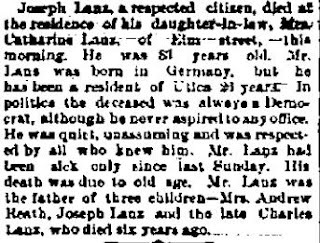 John Lanz died November 11, 1893 (the day after he signed his will) at the house of his daughter-in-law, Catherine Louis Lanz. My mother-in-law was shocked to learn that from all the stories which had been handed down from her mother and grandmother that no one had ever mentioned Margaret's parents moving to the US and living down the street in Utica. You never know what you will find when you keep digging. 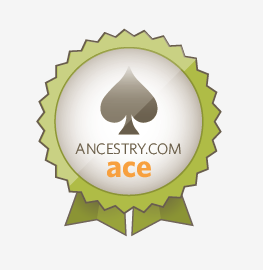 Of course, I still haven't found where the Lanz family originated in Bavaria. David and Mary Cary Fuller removed from Nova Scotia and arrived in Portland, Maine between 1840-1849 (they first appear in Portland in the 1850 US Census). It is unclear that they followed their sons to Portland or the sons followed them, but their six sons made Portland their home. I have several other posts regarding David and Mary Fuller in "Can a Published Genealogy be Wrong?". David and Mary's six sons were: David Bishop, James Henry, Theodore, Andrew Hanley, Benjamin W, and Collingwood E.
Their move to Maine was probably part of a migration which was taking place in Maritime Canada. In the period that followed the American Revolution, Nova Scotia's economy collapsed and a large number of Nova Scotian's migrated to the US pursuing a better economic future. Portland, Maine was a bustling city which was a very active seaport and it was a very short sail from Nova Scotia. It must have afforded the Fuller's a chance to seek better work options and be close to relatives who remained in Canada. David Fuller Sr. is identified in the Portland City Directory(1851) as a "Laborer". This was a common occupation designation. I believe it usually referred to unskilled labor who moved from job to job without a permanent employer. The 1850 US Census have David and Mary living with James, Theodore, Andrew and Collingwood. Interestingly, the 1851 City Directory states David Sr. living with Benjamin W Fullerr at 4 Ingraham Court. Reviewing the city directories and US Census records seem to indicate that none of the Fuller boys lived at any one location in Portland very long and it seems likely their were renters and never owned real estate in Portland. The Fuller boys occupations were tied to the sea. David Bishop Fuller's occupation as a "Rigger". In mid-to-late 1800's most ships were still powered by the wind. Which meant sails and rigging to operate them. A Rigger was responsible for the "rigging" meaning the systems which involved in moving the ship which includes the masts, ropes, sails and pulley system which was critical for the ship to be under sail. While this is not an occupation we can fully appreciate today, this must have been an important occupation in a seaside city. Interestingly, David Bishop Fuller is referred to as "Bishop Fuller" in the 1856-1857 Portland City Directory and his father as David Fuller. In all later editions of the City Directory he is listed as "David Fuller". Presumably, this is because his father has died, but I have never found any death records for David Fuller Sr. I do know that David Bishop Fuller died on June 11, 1901 in Portland, Maine. James Henry Fuller's occupation as a "Mariner". James was my 2nd great grandfather and have written about him in other posts including: "The Loves of a Sailor","Tales of Sea Serpents", and "The Death of a Sailor". James worked on ships as a seaman, mate, first mate and may have even been captain on some excursions. His mariner career began in 1843 in a sail from Eastport, Maine to Kingston, Jamaica. His last sail was in 1905 on a commercial vessel sailing from Portland to Boston. 62 years at sea. Impressive for such an unforgiving and challenging occupation. At the age of 78 he was accepted to a old sailor's home known as Sailor's Snug Harbor in Staten Island, NY where he lived out the remainder of his life. He died December 21, 1917. Andrew Hanley Fuller's occupation as a "Stevedore". A stevedore is another name for a dockworker or longshoreman. Their primary job was to load and unload ships. Since Portland was a bustling port, there must have been a lot of work for a stevedore who had a strong back. Andrew did spend some time as a seaman, too, but most records indicate him as a stevedore. Andrew and Collingwood served during the Civil War on the Revenue Cutter, Caleb Cushing. They were involved in the Civil War naval engagement where a confederate ship snuck into Portland harbor and commandeered the Caleb Cushing. I have written about the naval engagement in my post name the "Civil War Battle of Porland, Maine?". Andrew Hanley Fuller died in Nahant, Massachusetts on September 15, 1914. Collingwood Fuller's occupation as a "Stevedore". Andrew's brother Collingwood, was also a stevedore. Collingwood Fuller died in Portland on April 16, 1897. Benjamin W. Fuller's occupation as a "Blacksmith". In the mid-to-late 1800s a blacksmith was the person that people went to for fabrication of nails, screws, metal tools, etc. He probably did a substantial amount of work building iron parts for the local ships. The 1860 census indicates that Benjamin's mother, Mary and his brother, James, lived with him and his wife and kids. Based on the city director and census records it seems likely that he had the most stable occupation of all the Fuller sons. He outlived his wife and kids and died in the Portland Almshouse on December 11, 1911. Theodore Fuller died young. He died at the age of 24 on December 25, 1853. I am always looking for more information about the Fuller's of Portland. If you have any information or if you may be related, please contact me by email.